Some letters it might make sense for me to add that single pixel like the letter "I" or the lowercase "m" and "n" but I hope that doesn't create a spacing issue in the text. I do have to work on another update and should be able to get one up soon. It's only the I that has the problem. It looks like if you were to add one more pixel of space then it would be consistent with the other characters. You may also want to consider adding some of the fixes that was available for Final Fantasy V SNES too. They're around on slick productions. Actually, there are some bugfixes included in Noisecross' text editor. I'm away this week but soon I could upload an optional patch with these fixes. Discussion has now been moved to the project thread. As you should be able to see, the spacing on the capital I is a bit off (by a pixel, I think), causing it to blend into the n. Other than that it's superb so far. Maybe I'm too late to the party, but since this is based on the GBA version, why not go the extra mile and use its font? If Earthbound's font fits, this one definitely does and you can't get more authentic. Here's a version used in one of their DS releases. Each character is 10x10. I'll consider this, especially as there's an 8x8 version here that I could use for the menus. That was one of the things that made it difficult with Namingway Edition. I had to work around the character limit because figuring out HOW to get the spell menu altered is something that hasn't been found out yet. If you're able to get the names to work the way I did, I'm sure people would understand. I've tried to get around these limitations using squish tiles where avaliable, however there's not quite enough to remove the numbered spell system. It seems the tiles above the RPGe alphabet aren't loaded in battle for whatever reason, so I can't really use them. EDIT: Submitted a new version that changes Image to Blink. Also, should I create a personal projects page for this? It'd seem more natural to move the discussion there. I just checked out the latest version, definitely an improvement. I would lose the drop shadow on menu text though, it just doesn't look very good and isn't necessary without a gradient underneath. In fact, if you could change the menu text to the thinner font you're using for dialogue it would look a lot more cohesive, even if it's fixed width instead of variable width. Either way, I could easily include two patches. Edit: The darkened shadow doesn't actually look too great as it darkens the rest of the UI as well. Either way, I'll provide two seperate patches - one with the shadow, one without. If I used the dialogue font then the spacing would be r e a l l y l o n g.
Edit 2: Just submitted the latest version - the file now contains two patches for the shadowed and unshadowed font respectively. One thing - is it possible to extend the spell names and spell menu so that there are only two columns per row rather than three? This would allow me to better update the spell names. I've just submitted a new update which changes to the FF4-based font I posted above while fixing some more minor errors. For a new font, I could either use the thin FF4-styled VWF I put together in combination with the FF4 menu font, or I could use the GBA font along with the 8x8 version from here for the menus. What do you think is better? So here is what was used for both the in game text and menu font for FFIV. If you used this, it would look much better overall with space to extend spell names. Obviously you don't need to use the tiles I did for certain monster names like Scarmiglione and Barbaracia. 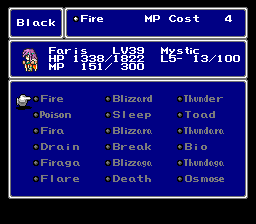 The FF4 font is currently implemented for the menu in the latest version. 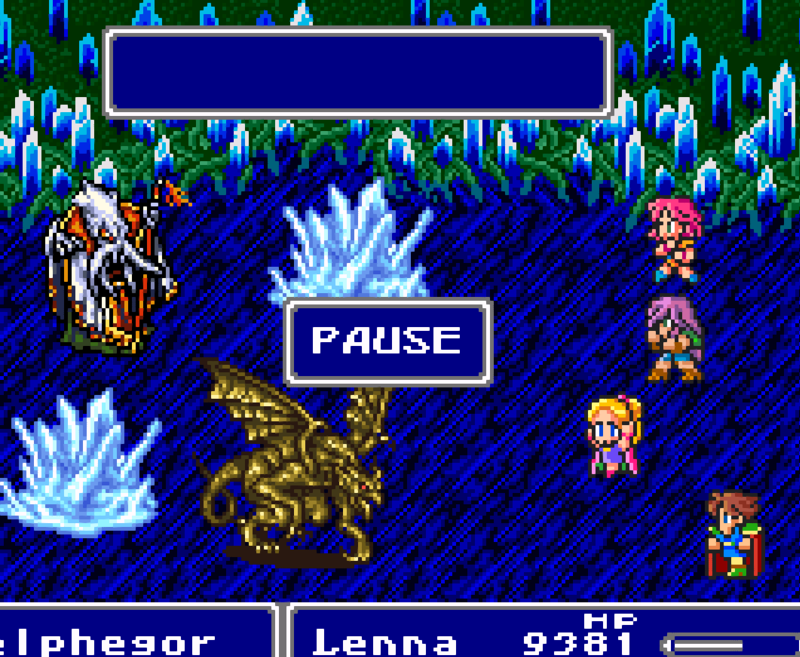 As for the dialogue font, the FF4 font is too wide for me to fit the longer battle dialogue in. I tried to compromise and create a thin VWF that's similar to FF4's font (image above), what are your opinions on that? EDIT: Although I did use the FF4 font from this site with a drop shadow, so it may have had some modifications to it. I must be patching it wrong. Do you have any idea what would cause the font to look weird like this? If you're using the ROM from fantasyanime.com, for whatever reason that ROM has problems with most patches. If not, I'm not sure. 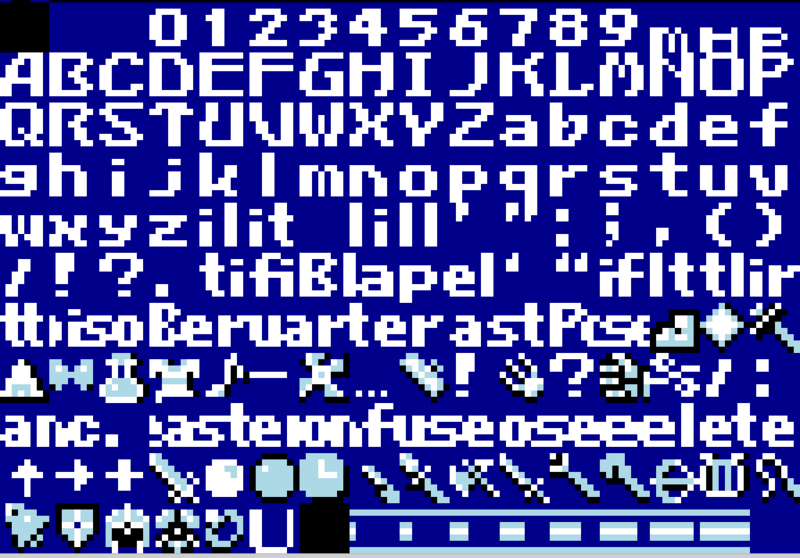 I've attempted to modify the current font to create a thin VWF that matches the niches in the FF4 font. Feedback is appreciated. I meant for both the menu AND the text font using the FF4 font. It's actually smaller overall than the FF6 font and making squish tiles like I did for Namingway Edition would have more space. Also it would make it seem more uniform instead of the tiny Earthbound font. RPGe's FF5 makes use of a VWF and I'd rather make use of that than use FF4's 8x8 font, which actually gives me less freedom when it comes to space. If you have any suggestions for a thin VWF then I'd be happy to take them into consideration. I kind of need a thin font to squeeze all of the battle dialogue in - or risk mangling, for example, Gilgamesh's most memorable lines. 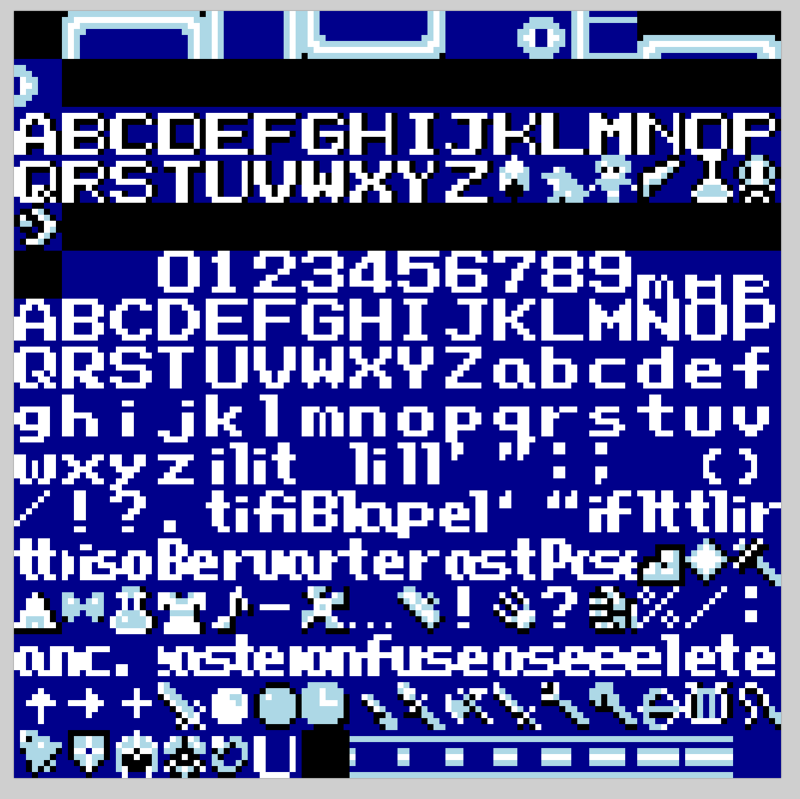 EDIT: If consistency is what you're going for, perhaps I could try and knock together a thin VWF based on FF4's font? ...could you make an optional patch for those who prefer the current spells naming (cure/cura/curaga, fire/fira/ firaga, etc) ? And about the Summon Shoat, could not it be Catoblepas (in-game ; Catobl/Bleplas/etc) to get the same name as the other games in the series ? I'm afraid I'm out of space for squish tiles, as it seems. I'm not sure if there's a way to extend the menu and the names themselves to allow for more characters, like the Blue Magic menu. Catoblepas I could change, seeing as the others are abbreviated anyway. EDIT: Just submitted an update. 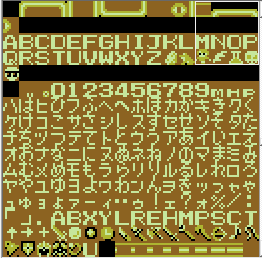 This update changes Shoat to Catobl, as well as implementing the FF4 font for menus. I also fixed one small oversight on my part. This looks really good however maybe trying the FFIV (US FFII) font would look a bit better overall since it's smaller and more manageable than the BIG Chicago font used on FFVI (US FFIII). It would also allow you to be more uniform even for the menus and monster names. You could also use squish fonts like I did with Namingway Edition to try and better update the spell names. There's plenty of space near the top, however for some reason FF5 doesn't seem to like using any tiles above the Chicago alphabet in battle - it loads in tiles from below instead. I've used the space I can and from what I know FF4 has much more free space for squish tiles. 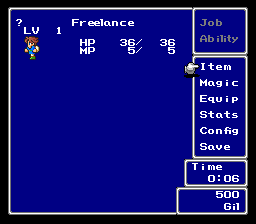 Either way, if you think the FF4 font would look better aesthetically then I'd be welcome to try it out. An update to the patch (version 1.02) has just been submitted for approval. I found some more space for squish tiles, and as such have edited spell names to restore GBA names for most spells (eg. Hypno is now Confuse, Silent is now Silence). The numbered spell system (Cure3, Bolt2) is still in place, though. I also made a few minor edits to monster names. That said, any reason the Earthbound font was chosen specifically? It's a nice font but it doesn't look very "Final Fantasy". 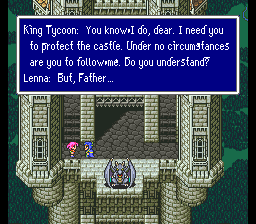 Why not keep it in the family and use the Final Fantasy III (US) font? Was it too chubby to fit all the text? I know Rodimus Primal modified the spacing a bit for his hack to make it take up less space. 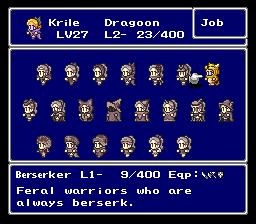 The font RPGe used was the one used in FF3US, but yes, it's too chubby, so much so that I'd have to trim down the battle text especially, mangling some of Gilgamesh's most entertaining lines in the process. I chose Earthbound's font because it was thin, as well as simple, although I did consider the GBA font at one point. All right, first impressions - there are a few inaccuracies with the font ripped from EarthBound - the uppercase I, and lowercase i and l characters have serifs while the rest of the letters don't. Other than that, it looks great! 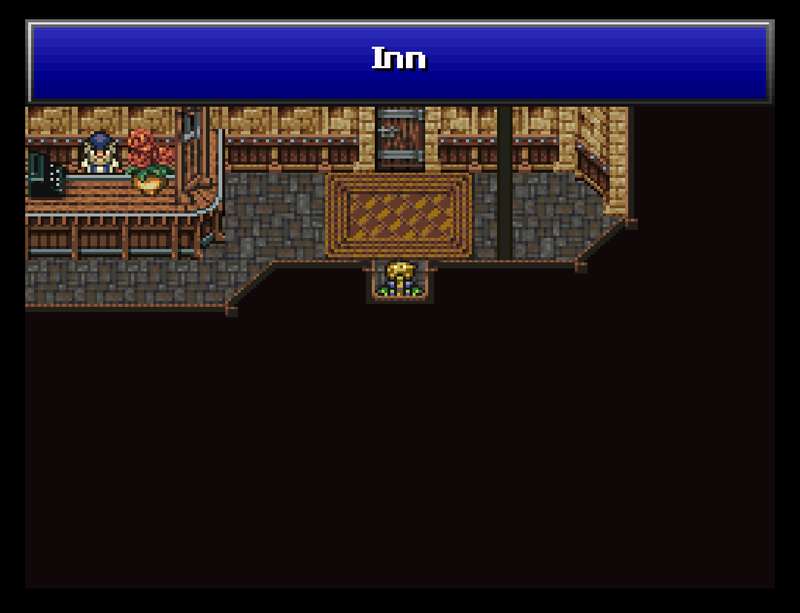 From what I can tell, RPGe's FFV has a minumum width of 3 pixels for characters, and all characters have a one pixel wide space at the end. This causes problems with Earthbound's one pixel wide characters, as they have to have a two pixel space, causing an annoying inconsistency. As such, I had to modify them. Does this use the numbered spell system? I saw Haste 2 in the screenshots and was curious. I know that FFIV hacks often used "squish tiles" for the spell prefixes. Yes it does. I was limited as to what I could do with squish tiles, so I mainly used them for the abbreviations that stood out to me as the most distracting (Bserk, Qrter, Hast2), and tried to come up with alternatives to some of the others (Charm -> Hypno, XZone -> Exile) - I'd like to hear feedback on these. While I'm at it, is there a way to extend the spell menu from three per row to two per row, like in the Woosley Uncensored patch for FF6? Bear in mind my hacking knowledge isn't too great.